When upgrading a database sometime you find that one or more SQLs run slower because of a new and suboptimal execution plan. Usually the number of those SQLs is pretty small compared to the overall workload but it’s not straightforward to understand what caused the plan change so even a small number can become tricky to track down. Each optimizer fix as well as any new feature could be responsible for the plan change but every patchset introduces quite a lot of fixes/features (just check V$SYSTEM_FIX_CONTROL to get an idea) so how can we find out which specific fix is responsible for our performance regression? The first good news is that CBO fixes are (usually) tied to the OPTIMIZER_FEATURES_ENABLE (OFE) parameter so we can quickly set this param back to the version of the database we upgraded from and check if the SQL returns to the old good performance. Assuming the answer is yes then the second good news is SQLT provides a way to evaluate each fix_control and CBO parameter, SQLT XPLORE. XPLORE is an independent module of SQLT that is available under sqlt/utl/xplore, it does require a very small installation (details in the readme.txt) and can be easily removed after our run is complete. Let’s play a little with XPLORE to better understand its potential and application. The plan cost is pretty small because the estimation for step 12 is very off and the real number of rows returned on such step is over 90% of the data, making the performance drop significantly. We have one of those cases where after an upgrade the SQL runs slow and setting OFE back to the previous version reverts the old good plan, let’s see how XPLORE is going to help us find out what changed my plan. In my specific case I reproduced both plans in a test environment where I have no data (took 3 mins to reproduce thanks to a SQLT TC 😉 so even the poor plan will not take more than a few milliseconds to run, just the parse time. To install XPLORE all we need to do is connect as SYS, run install.sql and provide the username/pwd of the user we want to run XPLORE from. In case our system runs with a non default CBO environment and we need it to replicate the plans then we will be asked to set the proper environment too so that XPLORE can define a baseline CBO environment. At the end of the installation a file called xplore_script_1.sql is generated, that’s our XPLORE driver script. Input parameters are the name of the script for our SQL (remember the mandatory /* ^^unique_id */ comment!!!) and the password for our application user. At this point XPLORE will test all the fix_controls and CBO parameters generating an execution plan for each of them (for some parameters, ie. 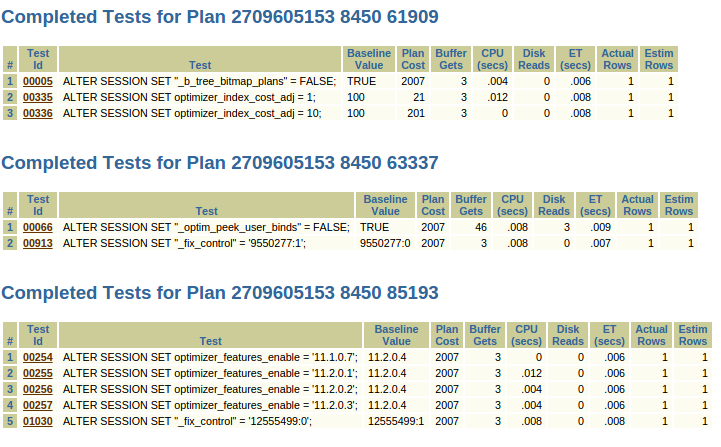 optimizer_index_cost_adj we test several values), packing the result in a HTML report. The section reports a list of all the PHVs identified, how many tests generated each plan as well as other useful information about those plans (some details later). We see that for our bad plan there are three lines, same PHV but different SQLT PHVs, that’s because those two additional PHVs are more restrictive and take into consideration additional factors (ie. filters) to better help differentiate between plans. The plan in line #3 has been generated by 1148 tests including our baseline (‘B’) “execution zero” that is with no parameter/fix_control change. It’s not surprising to have so many tests generating the same plan as the baseline because most of the fixes/params usually don’t affect each and every SQL. That’s the list of all the parameters and fix_controls that can lead to our good plan so we just need to go back to MOS and get some more information about those fixes to decide which one we want to test. In this case the answer is 12555499 because it generates the same identical plan as OFE=11.2.0.3. It’s usually better to use a fix_control rather than a parameter since the former is more likely to have a narrower scope than the latter. So using SQLT XPLORE we found in a few minutes which fix changed our execution plan, a workaround with a very narrow scope and also a way to research in MOS if any known issue related to this specific fix has been reported. 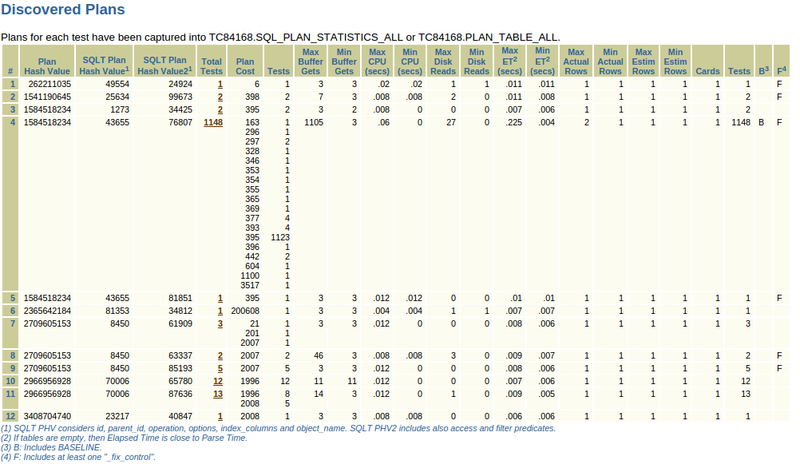 Categories: SQL Tuning | Tags: SQLT, XPLORE | Permalink. Great post Mauro. You may want to expand on how XPLORE tests all fix_control and CBO parameters.